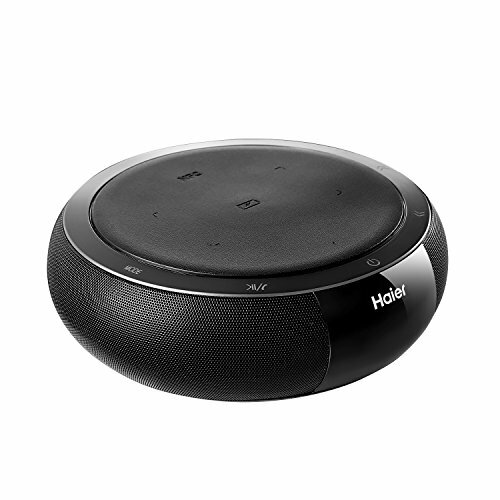 Large battery capacity: The Haier Bluetooth Speaker has 2600mah built-in battery capacity, supporting 3 Hours of continuous playing at max volume without any power input. You can carry it out with you as a persistent standby mobile power. Multi Functions: Bluetooth 4.0 Rechargeable Speaker, to reproduce dynamic and balanced range of sounds, to enhance music listening experience. Qi wireless charger for your phone, Waterproof and portable design, let you better enjoy pleasant outdoor life. Integrated microphone offers hands-free speakerphone functionality, allows you to enjoy your favorite tunes without missing a call. Easy access to hand free talking / volume up / volume down / fast forward ( skip ) / backward / pause / play / power buttons. Package Size(L x W x H): 26.50 x 24.00 x 11.00 cm / 10.43 x 9.45 x 4.33 inches. Only your phone has wireless charging feature can use this Haier Bluetooth Speaker to charge, if not you need buy a wireless charge receiver. Putting plug into phone charging hole and attached to the back of your phone, then you just need to put your phone on the QI wireless charging dock. ★ LESHP Bluetooth 4.0 Speakers, Hifi Speaker with 5W Enhanced Bass, Dual Channel Stereo,Wireless Charger PowerPort Qi Wireless Charging Pad for All Qi-Enabled Devices. ★ Qi Wireless Charging Design: Place your Qi standard wireless charging mobile phone or other device compatible with Qi standard on the charging plate. No needs cable or USB interface, When the blue indicator light is on, the battery is charged fully (Only applicable to phone integrated with wireless charging assemblies). ★ 360°Surrounded Stereo Sound Quality: 360 ° surrounded stereo sound effect, there are two 8 Ohm / 5 W acoustic driver, detailed presentation of wonderful music,letting more delicate and 360 ° stereo music come into your ears. ★ NFC Function: Fast pairing about 3 seconds, combination of NFC and Bluetooth portable achieve a convenient and long-distance transmission, controlling in 10 meters.Suitable size lets you can enjoy your life at home or outdoor. ★ App Remote Control: Support IOS7.0 above, Android4.3 or more full-function remote control, the full realization of intelligent.Let you enjoy intelligent life.